According to the Church records in the Lincoln City Archives, there has been a house here since at least 1634, serving as the Rectory for the Parish of Doddington. The oldest part of the house dates from about 1680, with the "new" large front being added in 1780, on top of foundations of an earlier building. The bay windows and extension to the drawing room were added in 1840. The Stables were built at the same time, on the site of a much older barn, the only remaining part of which is the wall behind the cooker. The Coach House, now the kitchen, was added later. When Lord Delaval owned Doddington, he rented the Rectory from the Rector from 1787 to 1804 so that he could conveniently house his mistress close by. There was always supposed to be a secret passage running between the cellar in the Hall to the cellar in the Rectory, but when the mains sewage pipe was buried between the two houses in 1970, nothing was found. In 1952, the Rectory was bought from the Diocese of Lincoln for £3,000, and has been the home of the Macalpine-Leny family ever since. "Nouveaux Riches to Nouveaux Pauvres" - the story of the Macalpine-Lenys, which gives the history of this interesting family, was published by Haggerston Press on 15 March 2012. See www.macalpine-leny.co.uk for details. The Stables and Coach House were converted for family use in 1996, and have been adapted for weekly holiday lets since 2005. 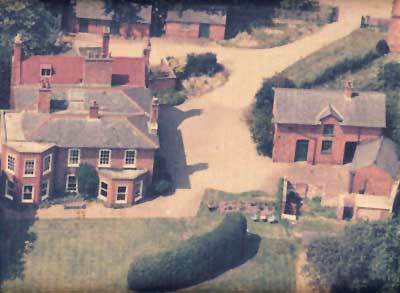 Aerial photograph of the Old Rectory, Stables and Coach House before conversion circa 1986.